The Unbearable Book Club for Unsinkable Girls | What YA Reading? I’m Adrienne Haus, survivor of a mother-daughter book club. Most of us didn’t want to join. My mother signed me up because I was stuck at home all summer, with my knee in a brace. CeeCee’s parents forced her to join after cancelling her Paris trip because she bashed up their car. The members of “The Unbearable Book Club,” CeeCee, Jill, Wallis, and I, were all going into eleventh grade A.P. English. But we weren’t friends. We were literary prisoners, sweating, reading classics, and hanging out at the pool. If you want to find out how membership in a book club can end up with a person being dead, you can probably look us up under mother-daughter literary catastrophe. Or open this book and read my essay, which I’ll turn in when I go back to school. It’s official: summer is here. If the blazing red sunburn currently ensconcing my shoulders isn’t proof enough, surely my latest binge-reading of brightly-coloured beach reads must be. I’ll warn you straightaway: many, many Sarah Dessen reviews are to come. Be prepared. Fortunately, The Unbearable Book Club for Unsinkable Girls was a superlative way to kick-start this summer. The plot dragged to such an extent that it effortlessly paralleled my heat-induced lethargy; the characters liked themselves with such narcissistic passion that I as reader never even had to waste any energy liking them myself; and the incredibly informative vocabulary words preceding each chapter abolished any apprehension I could possibly have felt in relation to the proper identification and classification of various plot happenings. As a final bonus, the novel’s protagonist, Adrienne Haus, is undergoing a brilliantly developped identity crisis to which I really feel teenagedom as a whole will be able to relate. Thank God for truly edifying main characters such as herself, yes? 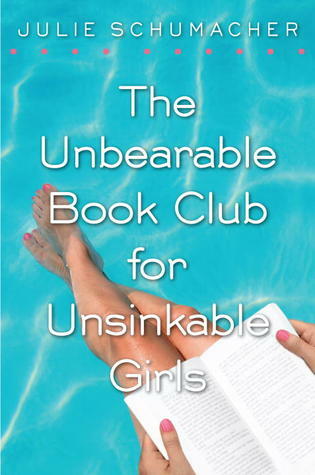 The Unbearable Book Club for Unsinkable Girls has the premise of really good, really cheesy TV movie, Disney kids et al. Four girls. Three mothers. One book club. One remarkable summer during which unlikely friendships will be forged, rules broken, and lives lost. It’s too bad, really, that it didn’t pan out, but at least the producers will have nothing left to lose, right? I think my foremost problem with The Unbearable Book Club for Unsinkable Girls was the style in which it was written. A purported AP English creative essay written by Adrienne, the novel came across as juvenile and strained rather than candid. Of course, it didn’t help that our narrator was completely and utterly insufferable as a person. Honestly I felt exceedingly sorry for Adrienne’s mother, a single working mom who frankly didn’t need to waste any time or energy on her daughter’s snide remarks, as well as every other character who had the misfortunate to come in direct contact with her living soul. I await with great impatience the day Adrienne comes to the startling realization that the world does not, in fact, revolve around her. One of these days, my friends. One of these days. High points include, and are limited to, an assortment of literary references littered throughout the novel, each one instantly appeasing any big-time reader, as well as a dramatic, if somewhat out of place, ending. Recommended for middle-graders, book club enthusiasts, and people whose options are limited to this and bad TV. 2/5 stars.